Lusy, as the ship was nicknamed, was built at John Brown and Company in Clydebank, Scotland. Her maiden voyage took place on September 13, 1907, a voyage from Liverpool to New York City. Now nearly eight years later, on her 101st voyage she was preparing to return to Liverpool. Lusitania and her sister ship Mauretania were the greyhounds of the Atlantic, traveling faster than most ships. They competed for the Blue Riband racing to break each others records. Although their size had been eclipsed by other ships, RMS Olympic and the former Titanic among them, Lusitania was still large for her time. The ‘cream of society’ traveled aboard the popular ship, enjoying the luxurious setting. The date was May 1, 1915, the Great War had engulfed Europe as Lusitania loaded cargo and passengers. The Imperial German Embassy had just issued a warning to passengers traveling aboard the ship. Security was strengthened as flatfoots, as well as federal agents, patrolled the area, on the lookout for saboteurs and spies. 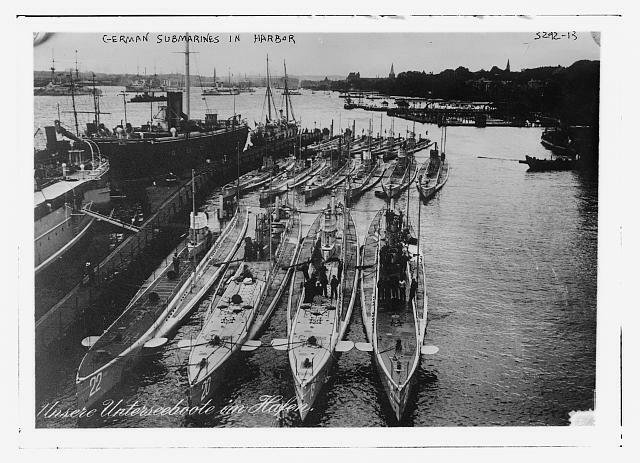 Unrestricted U-boat warfare had already sunk a number of British ships. Lusitania would be no exception. Just the day before, the German U-20 commanded by Lieutenant Walter Schwieger had left Germany in search of victims. One of the 1,959 aboard this voyage was 12 year old Avis Dolphin, a 2nd class passenger. Her mother, who ran a nursing home in Canada, was sending Avis to receive an education in England. In 1st class the Pearl family with their four children and two nurses were settling in. Eighteen year old Nurse Alice Lines had been hired to care for Audrey and Stuart Pearl and would go on to play a significant role during the sinking. In 3rd class the Williams family was returning to England. Annie Williams had been deserted by her husband. Traveling with her were her six children. Not long into the voyage three German stowaways were discovered. Rumors floated around and suspicions ran high. Could the three be, dare we say, saboteurs? No one knew, nor would they ever. The three went down with the ship after being locked away. Aboard the ship Avis became seasick. But that was soon remedied by a Professor Ian Holburn. Taking charge of “child Dolphin” he took her on a tour of the ship, even venturing into 1st class. In fact, the U-20 had been responsible for sinking a number of ships. But in comparison to Lusitania those ships were ‘small potatoes’. A mist that had enshrouded the Lusitania in the early hours of the 7th, soon cleared and the southern coast of Ireland was made visible. In the first place, to escape from direct pursuit by a submarine, the faster a ship goes the better chance she has of getting away; and, secondly, I think that a fast ship zig-zagging covers a large area of ground, a much larger area than a smaller ship, and, therefore, reduces the chance of any single submarine being in a position to attack her. Lookout Leslie Morton: Torpedoes coming on the starboard side. 95. Did you say that you yourself saw the wake of the torpedo? – I saw a streak like the wake of a torpedo. 96. Somebody cried out that there was a torpedo? – Yes, the Second Officer, on the bridge. Following the impact of the torpedo, was a second explosion. Historians debate on whether this was a shipment of illegal arms exploding or coal dust igniting causing the second explosion. It appears we will never know. Wireless operator Robert Leith sent out the SOS, as people scrambled about the ship wondering what had happened. Avis Dolphin was dining when the torpedo hit. Holburn managed to find Avis and put a lifebelt on her. Holburn put Avis and her traveling companions in a lifeboat, before he himself jumped overboard. But to his mortification, he seen Avis’ boat capsized spilling the girl into the ocean. Unlike Titanic, passengers would not have to worry about lack of lifeboats. Lusitania carried an adequate complement of boats. What she would lack was order and time. She went down in approximately 18 minutes compared to Titanic‘s 2 hours. The ship’s list became so bad that it was nearly impossible to lower the lifeboats. Contributing to the problem was the fact that the crew was mostly inexperienced. With the war in Europe, much of the sailors had either been drafted or deserted their ship while in neutral ports. 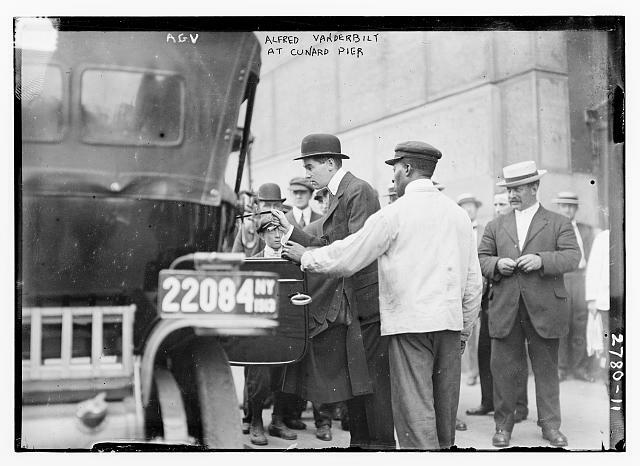 Millionaire Alfred Vanderbilt and his valet Ronald Denyer, both of whom died in the sinking, rounded up children and tossed them into lifeboats. Nurse Alice Lines, upon feeling the impact of the torpedo, took her young charges Stuart and Audrey Pearl up on the boat deck. Stuart was placed in a lifeboat, but because the boat was filled, Lines was not allowed to board. She was trapped on the ship with Audrey. With no alternative but the drastic Lines jumped overboard with baby Audrey. Landing in the cold Atlantic, she found herself next to Stuart’s boat. Fortunately someone was able to grab her hair and her haul her aboard. Also on board the sinking vessel were two brothers, who were members of the crew, John and Leslie Morton. Leslie was on of those who sighted the oncoming torpedo. After alerting the bridge, Leslie went to search for his brother. When the ship went down they were separated. Later while searching of each others corpse in a morgue, Leslie lifted a blanket that was covering a victim of the sinking. As he was, he became aware of some lifting the other side of the blanket. It was his brother, John. Sadly, not all stories would end happily as the Morton brothers. 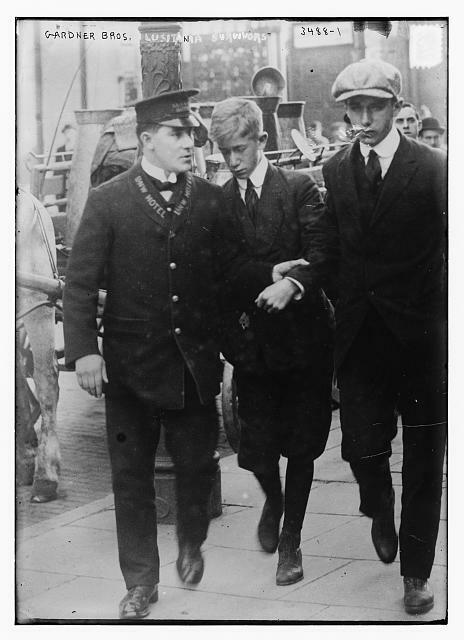 As Lusitania continued her descent father beneath the waves, Edith Williams and her little sister Florence tried to get away from the onslaught of water that was creeping over Lusitania. They were finally overtaken and in the process Florence’s hand slipped from Edith’s. The memory of the little hand slipping from her own, would haunt Edith for the rest of her life. Of the entire Williams family only Edith and her brother Edward survived. Avis, after being dumped from the boat was sucked beneath the ocean. Putting up a fight she made it tot the surface. Holburn in the meantime, was having his own struggle for survival. After swimming over to a lifeboat, the occupants denied him a spot on board. He instead held on to a rope that was trailing behind the boat. He did manage to live through the ordeal after being placed on a second boat. The U-20 after witnessing the disaster, dived beneath the Atlantic waves. On the Irish coast, some of whom had witnessed the tragedy unfolding, responded by sending boats out in hopes of picking up as many survivors as possible. First on the scene of the disaster was the Peel 12, a fishing vessel. One of the survivors that the crew of the Peel 12 picked up, was Professor Holburn. Holburn and Avis were reunited in Queenstown. The professor along with his wife Marion, saw Avis to her grandparents’ home in England afterwards. Maj. Pearl was taken aboard the Katrina, no doubt wondering what had become of his wife and four children. The surviving members, being Maj. Pearl, wife Amy, Stuart and Audrey, were reunited in Queenstown. The other two Pearl daughters and their nurse were lost. 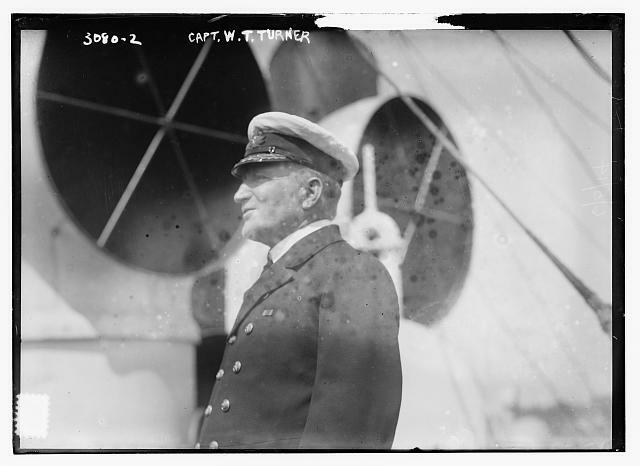 Captain Turner had been rescued and taken aboard the Bluebell. He would later be seen wandering around Queenstown in his shrunken uniform. On May 10 a funeral procession wound its way through Queenstown, carrying the victims to the cemetery. Many were buried in mass graves. The survivors numbered 768 with a loss of 1,198. The loss of life was unnecessary and foreshadowed the gruesome warfare in Europe’s trenches. Germany went on to issue an apology to the US for the 128 American lost on the voyage. Nevertheless, U-boat warfare would continue. The U-20 ran aground near Jutland in late 1916. Schwieger and his crew destroyed her, in hopes of no one making use of the U-boat. Schwieger’s death came when the U-88 he was commanding hit a mine. Although the maritime disaster did not bring America into the war, it soon became a rallying cry to join the army. Today the wreck is in terrible condition. Among other things that have contributed to it’s condition, is the fact that it was later used for target practice. There is also another book called “Lusitania: An Epic Tragedy” by Diana Preston. It’s amazing that anybody survived the sinking, given the coldness of the water. What a day that must have been. Yes, I’ve read some of that book and found it very thorough. I like the way you’ve integrated the personal stories into the wider narrative. Great article! Thanks, glad you like it. It’s usually the people that interest me the most in events such as this. I thought the Williams family was extremely sad and heartbreaking. I seen an interview with Edith Williams about the disaster and when they came to the part about Florence’s hand slipping away she broke down. That was so sad. Avis was a fighter though. Indeed. According to Wikipedia Avis died in 1996 which would have made her about 92 years at the time of her death. Excellent post, but awful awful story. It was tough for me to read. What a senseless act of violence and waste of life… as all wars are. Yes it is. A person could really get choked up reading a complete account of the story. I can’t help but wonder how Schwieger was able to bring himself to do such a thing. Yep. Even if the German Embassy had issued the warning it seems as if Scweiger could’ve turned a blind eye to the Lusy. Such a tremendous loss of life. Fabulous photos. Takes you right there. Scary! There are some rather heartbreaking photos of this event. Tragic.